Purpose: Use this document as a reference for viewing service indicator information in ctcLink. Audience: College staff responsible for maintaining student information. Enter the desired information into the ID field. Select the Effect list and choose the desired item from the drop down menu. 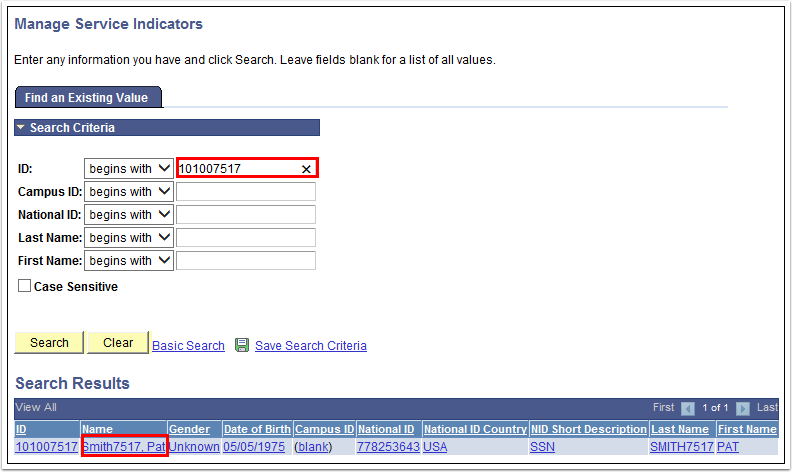 Select the Institution list and choose the desired item from the drop down menu. Select the Refresh link to refresh the page. Select the Code link next to the Service Indicator you would like to view. On the Manage Service Indicators page, enter appropriate search criteria and click the Search button. Click the name of the appropriate student in the search results. On the Manage Service Indicators page, select the appropriate Institution from the dropdown menu and click the Refresh link to the right of the menu. In the Effect Drop down list – select Positive, Negative, or All. Click Refresh to display the selected service indicators. Click on the Code link to view Service Indicator Details.